Susan could never be spared. First as a comfort to Fanny, then as an auxiliary, and last as her substitute, she was established at Mansfield, with every appearance of equal permanency. Her more fearless disposition and happier nerves made everything easy to her there. With quickness in understanding the tempers of those she had to deal with, and no natural timidity to restrain any consequent wishes, she was soon welcome and useful to all; and after Fanny’s removal succeeded so naturally to her influence over the hourly comfort of her aunt, as gradually to become, perhaps, the more beloved of the two. These words make possible Joan Aiken’s Mansfield Park Revisited, in which Susan Price’s story is told. 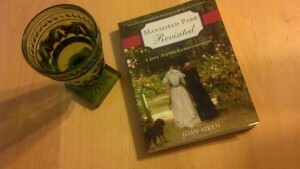 Aiken takes us back to Mansfield Park to reacquaint us with its inhabitants, introducing a few new ones, and continuing on in the vein of Jane Austen. We begin some years after Fanny and Edmund have been married with the death of Sir Thomas Bertram. Edmund and his elder brother, the new Sir Thomas, must attend to all their father’s affairs. This necessitates Edmund’s dispatch to their holdings abroad, while Tom takes on the role of head of house. With the departure of Edmund and Fanny, it becomes Susan’s story. Susan is not Fanny, but while Susan definitely has stronger opinions and decided ideas of her own she has mastered well the restraint necessary to navigate her role as Lady Bertram’s companion. With the temporary departure of Fanny and Edmund with their infant son, Susan is also called on to care for Fanny’s three year old daughter. Reverend Francis Wadham and his sister Ms. Osborne take up residence at the parish to hold down the flock while the younger Bertram is away. This introduces us to some new characters and we are also in for a bit more feather ruffling with the reappearance of the Crawfords. Aiken maintains the restrained tone of Austen, though perhaps at times too restrained. I have to admit there were moments I was not really sure what Susan’s feelings were or I underestimated the significance of certain scenes. That being said, it was still an enjoyable read. There is something to be said for a story that carries you along gently, which this story does well.